Arsenal v Chelsea - 28/1 ANY team to win a Corner at Ladbrokes! What a gift! 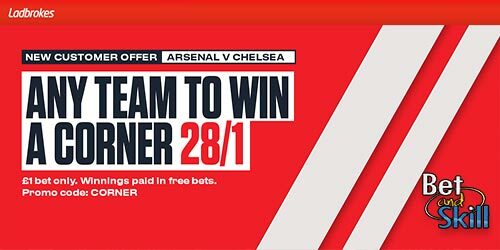 Ladbrokes are offering a HUGE 28/1 price boost on ANY team to win a corner in the Arsenal v Chelsea match! Stake £1 and get paid at 28/1 as soon as a corner is awarded! Easy money?!? Wanna make easy money on the first London Derby of 2018? Ladbrokes are offering a HUGE 28/1 ANY corner to be awarded in the Arsenal v Chelsea match! Unmissable offer! 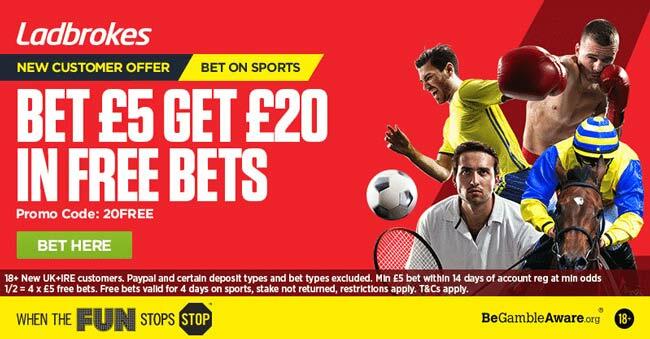 Join Ladbrokes via our special links and claim 28/1 a corner to be won in Arsenal v Chelsea! 3) Place a single bet of up to €/£1 on a corner to be awarded during Arsenal v Chelsea before the kick off. 4) If a team wins a corner, your account will be credited with extra winning to make payout equivalent to enhanced odds within 24 hours. 5) £1 bet only. Winnings paid in free bet tokens of £5. Offer available to new Ladbrokes Online & Mobile customers: Simply register today using promo code ‘CORNER’, deposit a minimum of £/€5, and place your first bet as a single bet of £/€1 on Any team to win a corner in Arsenal v Chelsea (28/1). This offer is available from 08:00 Tuesday 02/01/18 until kick off (19:45) on Wednesday 03/01/18. "Arsenal v Chelsea - 28/1 ANY team to win a Corner at Ladbrokes!"